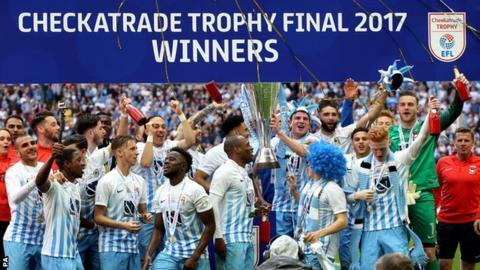 Coventry City memorably put aside their off-field woes with a glorious Checkatrade Trophy final upset against fellow third-tier club Oxford United. Gael Bigirimana's early close-range strike put League One's bottom side ahead at the break at Wembley. George Thomas then struck a wonderful right-footed half-volley to double the Sky Blues' lead after 55 minutes. The U's responded when sub Liam Sercombe's low right-foot shot found the bottom corner but City held on. Coventry's victory will probably still only partially cushion Sky Blues fans from the almost inevitable blow of relegation to English football's fourth tier for the first time since 1959. Mark Robins' side remain highly likely to go down, as they are 13 points adrift of safety with just six games left to play. But, 30 years on from winning the FA Cup on their first-ever trip to Wembley, at a time when they were still an established top-flight side, their long-suffering supporters were able to celebrate a day almost to match that May afternoon in 1987. Roared on by their noisy 43,000 following, the Sky Blues were ahead after 11 minutes when, from a right-wing Jordan Willis cross, Stuart Beavon's attempted volley was blocked invitingly into Bigirimana's path for him to slot home. The goal marked a memorable couple of days for the Burundi-born midfielder, who became a father to a baby girl in the hours leading up to the final. Oxford, for all of their apparent superiority and hard running in a floating system, always looked threatening but struggled to create meaningful chances, while referee Chris Sarginson ruled that Kane Hemmings had made the most of it when he went down in the box following a nudge in the back from Ryan Haynes. Coventry wide man Thomas had already twice served notice of another goal before he struck 10 minutes into the second half. After going almost clean through without getting the ball under control, allowing Chey Dunkley to intercede, Thomas then had a well-struck right-footed volley tipped over by goalkeeper Simon Eastwood. But Thomas' goal, when it came, was one to match anything Wembley has seen before as he controlled Kyel Reid's left-wing cross with one superb touch before drilling his powerful shot with pinpoint accuracy just inside the post. Coventry goalkeeper Lee Burge came to his side's rescue on three occasions, first tipping over Chris Maguire's free-kick before saving with his legs from Rob Hall either side of Oxford's 75th-minute reply. Burge's superb one-handed stop from Josh Ruffels led to a last-ditch goalmouth scramble, which City somehow survived, and meant Oxford were beaten at Wembley for the second year running having lost 3-2 to Barnsley in the same competition last season. Coventry City manager Mark Robins: "This was all for the fans. We needed to find a way and we found a way. "We had two chances and not many more than that. And I was dreading extra time, but Lee Burge making that save for us at the end was terrific. It's then that you start to think your name is on the cup. "Oxford are really good side on the upward curve. They played some good stuff. Michael Appleton's done a good job there. But to witness our performance with and without the ball in front of 70,000, of which 43,000 were our fans, made me very proud." Oxford United head coach Michael Appleton: "Coventry maybe had a hunger and desire to keep the ball out of the net more than we did. They had it in abundance. They made sure they were hard to beat and weren't going to concede. "For me, to work as hard as we did to make the final and then come up short was the most frustrating thing."